Hummingbirds are tiny and may seem like no more than a mouthful, hardly worth the bother of any predator looking for a meal. In fact, there is a wide range of predators that will eagerly hunt hummingbirds at feeding areas, nesting areas, or favorite perches. By learning the most popular hummingbird predators, birders can take steps to help protect hummers from becoming an untimely meal. Domestic and feral cats, which may even consider hummingbirds as playful toys, especially with the birds' bright colors and glittering plumage. Large insects such as praying mantises and orb-weaver spiders, which may lay in wait for hummingbirds to come too close. Large snakes and lizards that can strike at hummingbirds or may also be visiting hummingbird feeders to sip on nectar. Large frogs and fish that may mistake low flying hummingbirds for insects, jumping out of the water to snare the birds. Avivorous birds such as the loggerhead shrike and greater roadrunner, which will eat any other birds they can catch, even tiny hummers. Small birds of prey like the American kestrel, merlin, or sharp-shinned hawk, which hunt large insects as well as small birds like hummingbirds. Owls that may spot roosting hummingbirds when the birds are more defenseless in torpor, making them an easy snack to catch. These predators often stake out feeding areas, such as hummingbird feeders or flowerbeds, and wait for a hummingbird to come within range before striking. When hummingbirds feed, they are focusing on the food source more than any surrounding threats, and those few moments of sipping can put them at great risk from savvy predators. To help protect their eggs and chicks, many hummingbird nests are heavily camouflaged with bits of leaves, lichens, and moss decorating the exterior of the nest. Some hummingbirds will deliberately build their nests on thinner branches that will not hold up the weight of a stalking predator. Backyard birders can take a number of steps to help protect their local hummingbirds from various predators. Place baffles above and below hummingbird feeders, and position feeders so they are far away from areas where predators could be concealed. Take strong steps to discourage feral cats and always keep pet cats indoors so they cannot stalk hummingbirds. Carefully monitor hummingbird nests to watch for threatening predators, but be cautious so as not to overly stress the female parent hummingbird or draw undue attention to the nest. Watch for and relocate any predatory insects, lizards, or snakes far from hummingbird feeders, nests, or choice flowerbeds. Provide sheltered perches for resting hummingbirds so they aren't exposed to predation or at greater risk from predators. Create bird-friendly landscaping that includes adequate shelter for tiny birds, including thorny shrubs that can be used as secure nesting sites and naturally exclude most predators. Hang hummingbird feeders high enough to dissuade predators, and far from railings predators can use to reach feeding birds. 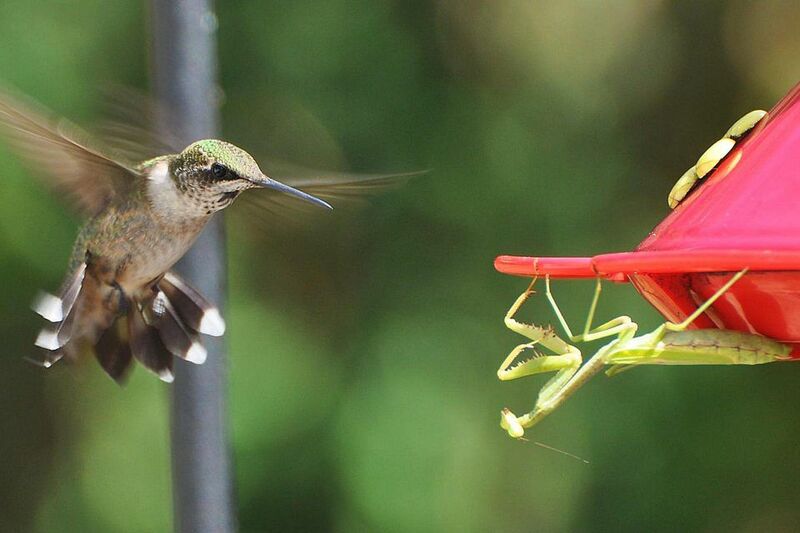 Despite even the most vigilant efforts, hummingbirds will occasionally succumb to predators. It is important to realize that this is part of the cycle of nature, and the strongest hummingbirds will survive to pass their better genes and survival skills on to the next generation. While hummingbird predators are a significant threat to these tiny birds, artificial threats can be just as devastating to local hummingbirds. In addition to being aware of predators that may cause harm to hummingbirds, backyard birders should take steps so that their yards are not another threat the birds face. Change hummingbird nectar frequently and keep hummingbird feeders clean. Spoiled nectar can cause disease and even death to hummingbirds from fungi that can grow in fermented sugar. Minimize bird window collisions by placing feeders at appropriate distances and breaking up reflective surfaces that can confuse birds. Even a light impact can be fatal to a bird as small as a hummingbird, and if their bill is damaged in a collision, it may be impossible for them to feed. Eliminate chemical pesticide use. Not only do these chemicals kill the gnats, small spiders, and other insects that are an important food source for hummingbirds, but chemicals could also be causing toxic buildup in the birds' bodies. Be aware of local bird rescue centers and bird rehabilitators that are licensed to care for sick or injured hummingbirds. This way, any birds that do run afoul of predators can be given proper emergency care when just a few minutes can be critical for their survival. Like all birds, hummingbirds are at risk from predators and other threats. Being aware of what creatures may be on the lookout for a hummingbird snack and what major backyard hazards hummingbirds face can help birders take steps to protect their flying jewels. 25 Fun Facts about Hummingbirds - Amazing Trivia! Want to Attract Hummingbirds? Get Rid of These Popular Flowers!